Brittle deformation causes bonds to break in an irregular way. Shredding paper and shattering glass are good examples. Elastic deformation is temporary. The molecules will return to their original positions as soon as the force is removed. Rubber bands and tires are elastic, as well as steel rods and wooden boards. Plastic deformation is permanent. Plastic deformation can be observed by bending a metal spoon. 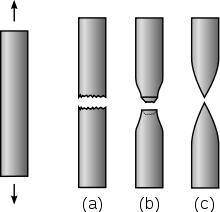 Most materials are capable of all three types of deformation. Small amounts of stress cause elastic deformation, but large amounts will cause plastic deformation. In the event of repeated deformation or tremendous stress, brittle deformation occurs. Solids are incompressible. Solids may break or deform under stress, but they tolerate little compression. For instance, a wooden plank will break if force is applied, but it will not compress like a sponge. The only reason sponges compress is because they contain air pockets and undergo elastic deformation. Otherwise, solids will not compress. At the molecular level, this happens because the intermolecular bonds do not change size without breaking. Some solids, usually metals, have properties like ductility and malleability. A ductile material can be stretched into long, thin wires. A malleable substance can be hammered into very thin sheets. Gold and copper are some of the most malleable and ductile substances known. These properties occur as a result of the metallic bonding. Solids occur when there is enough intermolecular bonding to hold the molecules of a substance into a relatively rigid structure. The molecules are close together, and their movement is restricted to vibration. Solids occur at the lowest temperatures and highest pressures. As the temperature of a solid increases, so does the kinetic energy of its molecules. At the melting point, the molecules have enough energy to overcome their bonds and melt into a liquid. Likewise, a liquid will freeze once its molecules are not moving fast enough to avoid strong intermolecular bonds. Compounds that have ionic bonding or metallic bonding are most likely to be found in the solid phase due to their high melting points. Also, covalent network substances (like diamond or quartz) are solids because the atoms are secured with covalent bonds, requiring extreme amounts of energy to separate them. Crystalline solids have a molecular structure with a specific geometric shape. The solid has a specific melting point at which all molecules begin to break free of their bonds. Substances like salt, diamond, and quartz are crystalline solids. These solids usually form by cooling a liquid slowly, so that the molecules have time to arrange themselves in a crystalline structure as their bonds form. Amorphous solids have a molecular structure with no specific shape. The solid melts over a range of temperatures because the amount of energy needed to break the bonds varies from molecule to molecule. Substances like coal and glass are amorphous. Amorphous solids usually form when a liquid is cooled quickly, so there is no time for the molecules to arrange themselves into a crystal. Crystalline solids are typically harder and more rigid. Coal and diamond are both made from elemental carbon, but coal is amorphous and diamond is crystalline. Because of its crystal structure, diamond is one of the hardest substances known, whereas coal can be scratched away with a fingernail. The crystal structure also explains diamond's brilliant, transparent appearance. Coal is black and dull because the disorder of the atoms does not allow light to pass. Ionic solids and metallic solids are always crystalline. Covalent network solids can be crystalline or amorphous. Van der Waals solids are always amorphous. In crystalline solids, the atoms are arranged in a specific pattern. The smallest repeating part of this pattern is called the unit cell. The unit cell may have more atoms than the empirical formula of a substance because the geometric shape may require several atoms. In the case of sodium chloride, the empirical formula contains only two atoms, but the unit cell has 27 atoms. The molecules of a solid are close packed. They arrange themselves in the densest shape possible. Usually, two different patterns occur. Halite, or rock salt, exhibits FCC packing. FCC crystals have three alternating layers, described as ABCABCABC (every third layer is the same). The layers are arranged so that each unit cell is halfway between the two unit cells above or below it. HCP crystals have two alternating layers, described as ABABABAB (every other layer is the same).